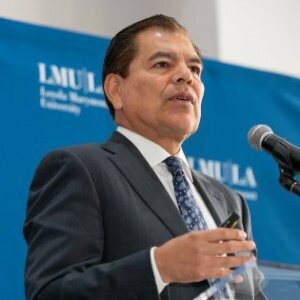 Fernando J. Guerra, professor of political science and chicana/o latina/o studies, is the founding director of the Center for the Study of Los Angeles at LMU. His area of scholarly work is in local governance, urban politics, and racial and ethnic politics. Dr. Guerra has been a principal investigator in over 20 major studies on Los Angeles, leadership studies and electoral politics. He is also the principal investigator for the largest general social survey in the Los Angeles region. Dr. Guerra has served on standing commissions, blue ribbon committees, and ad hoc task forces for the City of Los Angeles, the State of California, and regional bodies in Southern California. He is a source for the media at the local, national, and international level and has been cited and interviewed by The Los Angeles Times, The New York Times, The Washington Post, KCAL9, KCBS, PBS News Hour, KPCC Radio, La Opinión, The San Jose Mercury News, The Chicago Tribune, The Wall Street Journal, Newsweek, Business Week, The Economist, The Guardian and other media outlets in Latin America, Europe, and Asia. In the state of California, the number of signatures required to qualify a measure for the ballot is based on the number of votes cast in the gubernatorial race. The rise in signature requirements will make efforts to qualify future propositions more expensive. Loyola Marymount University exit poll found Villanueva bested McDonnell in demographic categories such as younger voters, women, people of color, Spanish-speakers, liberals, moderates, and people who earn less than $100,000 annually. Fernando Guerra was quoted by KQED News for his remark that a race between Antonio Villaraigosa and Gavin Newsom would have been more exciting, rather than a race against John Cox. Fernando Guerra explains his reasoning as to why voter numbers are a record high: it is easier to vote in California now through DMV programs and online registration. From the killing of a journalist to the midterm elections, Loyola Marymount professor Fernando Guerra discusses the latest in politics. Dr. Guerra discusses Angelenos' public opinion of the Los Angeles Police Department in the last couple of decades and how these perceptions should be considered when appointing the next LAPD Chief. Guerra, Fernando J., Gilbert, Brianne. Chapter in "Local politics and mayoral elections in 21st century America : the keys to city hall" edited by Sean D. Foreman, Marcia L. Godwin. Guerra, Fernando J., Barreto, Matt, Ramirez, Ricardo, Fraga, Luis. Chapter on Latino voters in California as part of the volume titled" Beyond the Barrio: Latinos in the 2004 Elections"
The characterization of the Latino role in the 1992 election is sobering. A number of commentators on California politics and many Latino leaders saw 1992 as representing an opportunity for Latinos to be major players in statewide elections. Using the California experience, this chapter offers the following model of conditions that must be met for Latinos to influence any statewide election. These conditions are subdivided into two categories. The first, contextual conditions, is linked in that each represents factors outside Latinos' effective control. The second category, strategic conditions, is linked in that these conditions are largely within effective control of Latino leaders, organizations, electorates, and communities generally. Many new electoral opportunities for Latinos presented themselves for the first time in ten years. The 1992 reapportionment created a congressional seat in the heart of the East Side of Los Angeles, which pushed the three seats already held by Latinos farther east.